The subject tells who or what the sentence is about. Then the verb and the rest of the predicate give information about what the subject does or is. Again, the predicate is the rest of the sentence-- most importantly, the verb, and sometimes also an adverb, prepositional phrase, or nouns that are objects of the verb. The little birds were singing happily in the treetops. Mary walked rapidly to the store. She wanted to get home before dark. I hope for an ‘A’ on the test tomorrow. Tonight, Bill and I need to study hard for the test. Jim and Susan do not like homework. In questions the subject (S) follows the helping verb (HV) but precedes the main verb (MV) and the rest of the sentence, so the predicate is divided: HV- S- MV- rest of sentence. To make the examples clearer, the helping verb is black, the subject is orange, and the main verb and rest of the predicate are blue. Does Jeff study every night? Do Bill and Jeff work together? Are they swimming right now? Is Sarah going to the party? For more on question formation, see Question Formation .See also Negative Sentences. In the examples above, ‘in the treetops,’ ‘to the store,’ ‘before dark,’ and ‘for the test tomorrow’ are prepositional phrases. Predicates can also include direct or indirect objects.The subject does something to the direct object: The boy hit the ball.Mom bought gifts.Certain verbs can also have an indirect object:The boy gave me the ball.Mom bought us gifts.Indirect objects always precede (go before) direct objects. Instead of using an indirect object, you could express the same idea with a prepositional phrase using ‘to’ or ‘for’ after the direct object:He gave the ball to me. Mom bought gifts for us. Some verbs cannot take direct objects, and other verbs require them. Dictionaries will tell you if a verb is transitive (takes an object), intransitive, or both. In the first examples above, ’sing’ and ‘study’ are intransitive. But both can also be transitive: we can sing songs or study English. Other verbs like laugh or sleep are always intransitive. They cannot take a direct object at all. I hope you don’t feel overwhelmed by all these grammar terms. You don’t need them to speak English, but understanding English sentence structure can sometimes help with reading or writing. When you write, it’s important to remember: . 1. Each sentence in English needs a subject and a verb. In questions and negative statements, it’s the helping verb that must agree with the subject. Also, for questions put the helping verb before the subject, and the main verb and the rest of the predicate after the subject. (Does he study English? Do they all study French? For an explanation of the parts of speech: nouns, pronouns, verbs, prepositions, etc., see English Parts of Speech. English sentence structure can get more complicated. We can combine ideas by putting two clauses (potentially separate sentences) together to form one longer sentence. 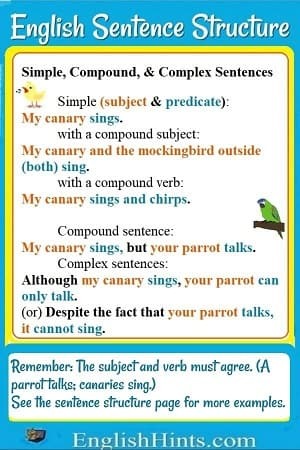 See Compound Sentences and Complex Sentences. There is also more explanation (as well as some good examples) of simple sentences on Question Formation or Negative Sentences. Home> English Grammar Lessons> English Sentence Structure. 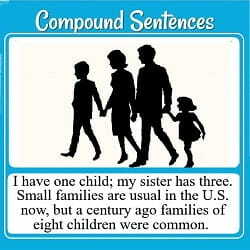 Compound sentences combine two independent clauses into one sentence. They're not hard with this explanation & a few examples!